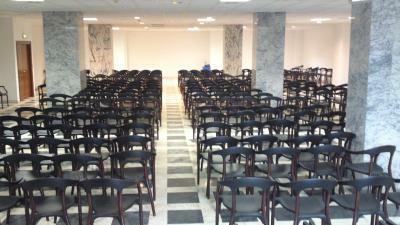 Walking distance to city center, very close to a shopping center with a few restaurants. Good location, walking distance to old town and museums. If you travel by bus, its just at the bus station.If you travel by car, there is parking garage. The hotel was clean and the location is very good. Hotel has good location only step away from centre of Valencia. Rooms are clean, however breakfast is not very good. Location was great. 10-15minutes walk to the city centre. Shopping Centre - Nuevo Centro exactly opposite to hotel, with lots of restaurants and cafeterias to choose from. Excellent location for our needs. Accommodation was very good. Nothing like ! The worst hotel I seeing in my life , there are hotel with 2 star looks better than this. Good location. Public transport is at walkable distance and the hotel is adjacent to Autobus station. Nice breakfast, friendly and helpfull staff, clean bathroom, good location near the centre and subway. Close to a large shopping center and restaurants. 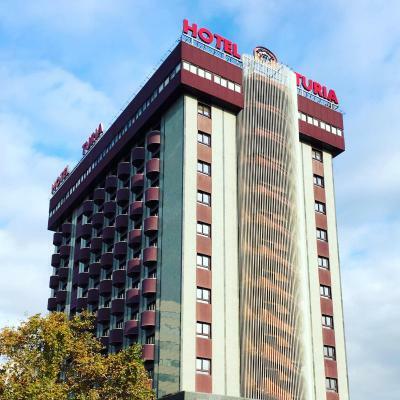 Hotel Turia This rating is a reflection of how the property compares to the industry standard when it comes to price, facilities and services available. It's based on a self-evaluation by the property. Use this rating to help choose your stay! One of our best sellers in Valencia! 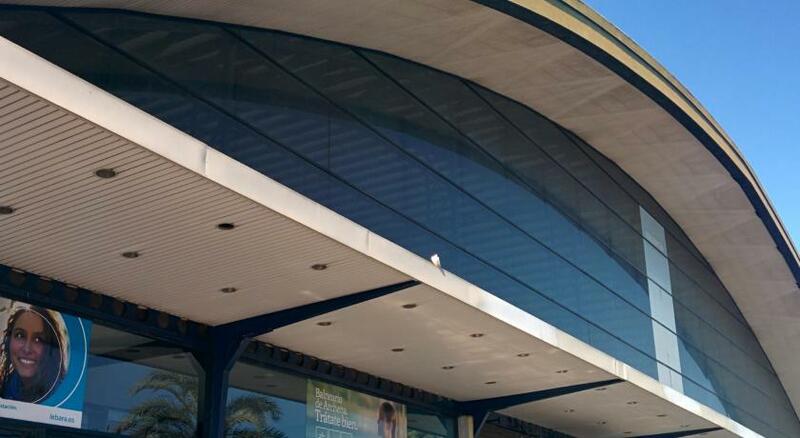 Hotel Turia is next to Valencia Bus Station, and 1,150 feet from Turia Metro Station. Set across the Turia Park from the Botanical Gardens, it is a 20-minute walk from the cathedral. All air-conditioned rooms at the Turia Hotel have a TV and most feature a private balcony. There is a safe, and the private bathroom comes with a hairdryer. Nuevo Centro Shopping Center and El Corte Inglés Department Store are opposite the hotel. Excellent public transport makes it easy to reach City of Arts and Sciences, airport and Convention Center. The Turia has a bar on site, as well as a tour desk and a 24-hour front desk. Free Wi-Fi is available throughout. There is on-site parking at an extra cost. Campanar is a great choice for travelers interested in parks, walking and city walks. When would you like to stay at Hotel Turia? This air-conditioned room has a TV and exterior views. There is a laptop safe, and the private bathroom has a bathtub, bidet and hairdryer. Some rooms include a private balcony. Private parking is available on site (reservation is not needed) and costs EUR 9.90 per day. Spacious suite with double sofa bed in the living room. It has exterior views and a private bathroom with a bathtub and a bidet. This room can accommodate up to 5 guests (see Hotel Policies for details of supplements). Hotel surroundings – This neighborhood is a great choice for travelers interested in parks, walking and city walks – Check location Good location – show map Guests loved walking around the neighborhood! 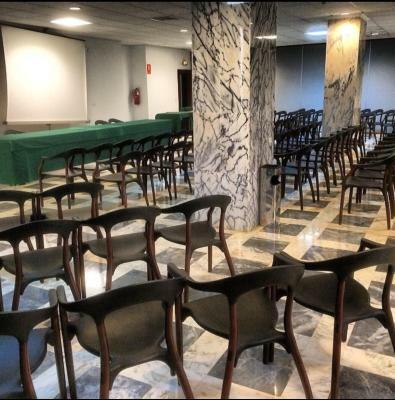 House Rules Hotel Turia takes special requests – add in the next step! Hotel Turia accepts these cards and reserves the right to temporarily hold an amount prior to arrival. Please note that private parking is for a maximum of 70 cars. Please note that payment is due on arrival. Bed very uncomfortable. The acoustics in the hotel were such that when people arrived in the night it sounded like they were coming into your room. Everything is old. Absolutely expensive for value. This hotel needs a refresh and a polite staff. Staff were not very cooperative. Hotel facilities are old and cleaning was not that good. Wifi is very poor. Price is considered too high based on the points mentioned here. More or less good location. Very close to the splendid former river which been so well redeveloped into foot paths, sports facilities and open spaces and the amazing Arts and Science Centre and a short walk to to the historic centre . The hotel is slightly dated but has lovely marble floors and nice seating areas. The concierge and the barman could not have been more helpful and friendly. Decor is a bit outdated. Location: it is a 15' walk from the old town and restaurants and at night the area might be a bit shady (with the bus station next door) Given it's on a major street, it can get very noisy due to the traffic. Hotel rooms are huge and clean, we got a room facing the park with a small balcony and it had a very nice view. No internet coverage on the 7th floor and had to sit in the lounge to get connected. Friendly staff who made our stay very pleasant. 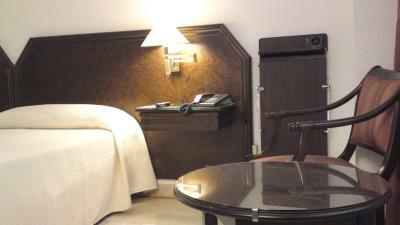 The vicinity to the city centre, side of the room, cleaning, kindness of the personnel.